The Colombo Additional Magistrate today ordered to temporarily suspend the driving license of cricketer Ramith Rambukwella, who was arrested on drunk driving and assault charges. 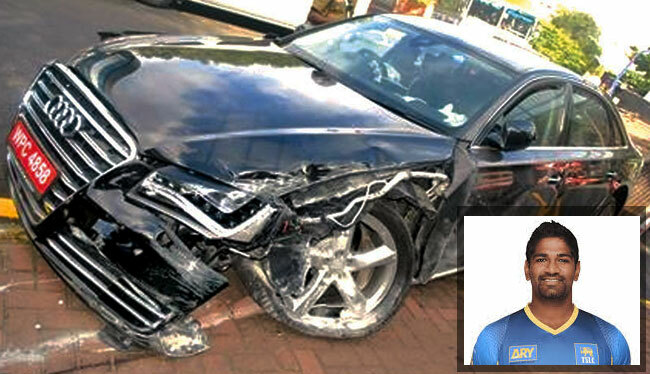 The Sri Lankan cricketer, who is the son of former minister Keheliya Rambukwella, was arrested by Narahenpita Police on Friday night (March 9) after he hit a motorcycle while driving under the influence of alcohol in Nawala and then allegedly assaulted the two persons traveling on the motorcycle. Rambukwella was arrested in 2016 as well after an accident and was charged with drunk driving. He had also landed in a soup in 2013 after causing a mid-air panic in an inebriated state. The then 21-year-old, who was travelling back from West Indies on a British Airways flight in July 2013, tried to open the cabin door at 35,000 feet in an inebriated state. Rambukwella has represented Sri Lanka in two T20Is, the last of which came against England in July 2016. He made his international debut in November 2013. As a consequence of the arrest, Rambukwella is set to lose his Sri Lanka Cricket contract.